Description Book chapter in Soegaard, Mads and Dam, Rikke Friis (eds.). The Encyclopedia of Human-Computer Interaction, 2nd Ed. Aarhus, Denmark: The Interaction Design Foundation. Use Understand basic concepts of good data visualization. License The Creative Commons Attribution-NoDerivs Licence & The Interaction Design Foundation Addendum to the Creative Commons licence. Review full copyright terms. Download Available online at InteractionDesign.org. An excerpt from the chapter is reproduced below; however it omits some of the resources thoughtful commentary available on the original site. Data visualization is the graphical display of abstract information for two purposes: sense-making (also called data analysis) and communication. Important stories live in our data and data visualization is a powerful means to discover and understand these stories, and then to present them to others.The information is abstract in that it describes things that are not physical. Statistical information is abstract. Whether it concerns sales, incidences of disease, athletic performance, or anything else, even though it doesn’t pertain to the physical world, we can still display it visually, but to do this we must find a way to give form to that which has none. This table does two things extremely well: it expresses these sales values precisely and it provides an efficient means to look up values for a particular region and month. But if we’re looking for patterns, trends, or exceptions among these values, if we want a quick sense of the story contained in these numbers, or we need to compare whole sets of numbers rather than just two at a time, this table fails. Although data visualization usually features relationships between quantitative values, it can also display relationships that are not quantitative in nature. For instance, the connections between people on a social networking site such as Facebook or between suspected terrorists can be displayed using a node and link visualization. In the following example, people are the nodes, represented as circles, and their relationships are the links, represented as lines that connect them. People have been arranging data into tables (columns and rows) at least since the 2nd century C.E., but the idea of representing quantitative information graphically didn’t arise until the 17th century. For this innovation we have the French philosopher and mathematician Rene Descartes to thank. He developed a two-dimensional coordinate system for displaying values, consisting of a horizontal axis for one variable and a vertical axis for another, primarily as a graphical means of performing mathematical operations. It wasn’t until the late 18th century that we began to exploit the potential of graphics for the communication of quantitative data, for which we have the Scotsman William Playfair to thank. Playfair pioneered many of the graphs that are commonly used today. He was the first person to use a line moving up and down as it progressed from left to right to show how values changed through time, as in the example below. He also invented the bar graph, and on one of his off days he invented the pie chart, which we have since found relatively ineffective, because it encodes values as visual attributes (primarily the area of each slice as well as the angle that it forms in the center of the pie) that we cannot easily perceive and compare. Figure 35.4 (download or view full resolution) — Playfair included this graph in his The Commercial and Political Atlas (1786) to argue against England’s policy of financing colonial wars through national debt. The use of quantitative graphs gradually increased over the years, but their methods and effectiveness evolved little until the second half of the 20th century. Jacques Bertin laid the foundation for much of the progress that’s been made during the last half a century with the publication in 1967 of the bookSemiologie graphique (The Semiology of Graphics, Bertin 1967). His work was pivotal because he discovered that visual perception operated according to rules that could be followed to express information visually in ways that represented it intuitively, clearly, accurately, and efficiently. The person who really introduced us to the power of data visualization as a means for exploring and making sense of quantitative data was the Princeton statistics professor John Tukey, who in 1977 gave form to a whole new statistical approach called exploratory data analysis. In 1983, the person working in the field today whose name is recognized above all others, Edward Tufte, published his groundbreaking book The Visual Display of Quantitative Information. In it he pointed out that there were effective ways of displaying data visually and then there were the ways that most people were doing it, which didn’t work very well. Also working to improve data visualization practices around this time was William Cleveland, who extended and refined data visualization techniques for statisticians. Soon thereafter, a new research specialty emerged in the academic world, which was coined “information visualization. In their 1999 book Readings in Information Visualization: Using Vision to Think, Stuart Card, Jock Mackinlay, and Ben Shneiderman collected the best academic work that had been done by that time into a single volume and made its discoveries accessible beyond the walls of academia (Card et al 1999). Since the turn of the 21st century, data visualization has been popularized, too often in tragically ineffective ways as it has reached the masses through commercial software products. Gratefully, amongst the bevy of products that promote data visualization in ways that feature superficially appealing aesthetics above useful and effective data exploration, sense-making, and communication, there are a few serious contenders for our attention who are helping us fulfill its potential in practical and powerful ways. Among those who have contributed to our understanding of data visualization, Colin Ware has done the most to base its practice on an understanding of human perception. Ware’s two excellent books — Information Visualization: Perception for Design (Ware, 2004) and Visual Thinking for Design (Ware 2008) — compile, organize, and explain what we have learned from several scientific disciplines about visual thinking and cognition and apply that knowledge to data visualization. The traditional way to display this information graphically involves a pie chart, illustrated below. How well does this pie chart satisfy our criteria for effectiveness. Let’s consider each of the requirements. Clearly indicates the nature of the relationship? Yes. The primary strength of a pie chart is the fact that it clearly indicates a part-to-whole relationship between the values. Represents the quantities accurately? No. Pie charts encode values redundantly through the use of three visual attributes: the area of each slice, the angle formed by each slice at the center of the pie, and the length of the each slice along the pie’s perimeter. Even when the area, angle, and perimeter of each slice is calculated properly, it fails in that we cannot perceive any one of these attributes accurately. Visual perception in humans has not evolved to support accurate decoding of areas, angles, or distance along a curve. Makes it easy to compare the quantities? No. Because we cannot perceive the values accurately, we also cannot compare them easily or accurately. Furthermore, in this particular pie chart, because a legend has been used to label the slices, we are forced over and over to look up the meaning of the slices we wish to compare by finding the right color, which is often difficult to discriminate. The fact that this pie chart has been rendered in 3-D also complicates the simple act of comparison because the perspective skews the relative size and shape of the slices, making slices on the bottom appear larger and more salient than similarly sized slices on the top. Makes it easy to see the ranked order of values? No. Even though the slices are displayed in ranked order from the highest value (heart disease) at the top and continuing clockwise to the smallest, excluding the final “All other causes” slice, this ranking isn’t obvious, because it’s difficult to compare the slices. For example, the red cancer slice appears to be larger than the blue heart disease slice due to the 3-D effect, which has given it more visual weight. Effects such as the 3-D rendering of this pie chart are sometimes used to intentionally mislead. Makes obvious how people should use the information? Partially. Although the pie chart succeeds in encouraging people to compare the slices to understand the relative contributions of each part to the whole, it fails to support this operation effectively. Given the ways in which this pie chart has failed to match human perception, let’s consider an alternative form of display.The following bar graph displays the same set of values, but in a way that can be more readily perceived. Let’s review the effectiveness of this bar graph using the same criteria as before. Clearly indicates the nature of the relationship? Yes. In and of itself, a bar graph does not declare the part-to-whole nature of the relationship between these values, because, unlike pie charts, bar graphs can be used to display other relationships as well. 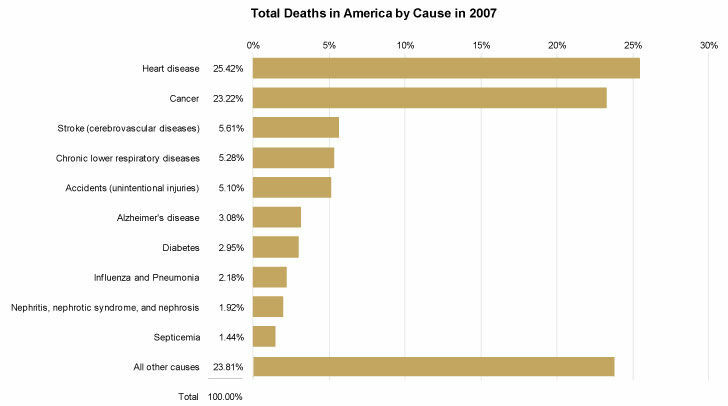 This particular bar graph, however, includes components that make the nature of the relationship clear, including the title (“Total Deaths…”) and especially the column of values that add up to 100%. Represents the quantities accurately? Yes. The horizontal position at which each bar ends and the length in relation to the quantitative scale along the x-axis both encode these values in a way that can be accurately perceived. Unlike areas, angles, and the lengths of curved lines that don’t share a common baseline, 2-D position and the length of straight linear objects such as these bars, which share a common baseline and run parallel to one another are visual attributes that we can perceive with a high degree of accuracy. Makes it easy to compare the quantities? Yes.Because we can perceive these values accurately when encoded as bars, it is also quite easy to compare them. Notice how easy it is to see differences in the lengths of these bars that could not be easily seen when comparing the slices of the pie. Also notice that when each bar shares the same color, unlike the pie’s slices, which varied in color, our eyes are encouraged to compare the bars because of that likeness. And because the bars are labeled directly with the names of the causes of death, we must no longer do the work that a legend requires when comparing the values. Makes it easy to see the ranked order of values? Yes. Because differences in the bar’s lengths are easy to perceive, the fact that they are ranked from highest to lowest, except for the final “All other causes” bar, is obvious. By arranging the bars in ranked order, we’ve also made comparisons much easier by placing those causes of death that are closest in value near one another in the graph. Makes obvious how people should use the information? Yes. 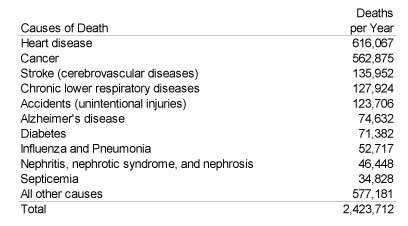 The fact that these bars should be compared to understand the varying degree to which these causes of death contribute to total deaths is intuitively obvious. The point of comparing the perceptual effectiveness of the pie chart and bar graph has not been to make a case against pie charts (although this case deserves to be made), but to illustrate how we should always judge a visualization’s merits by the degree to which we can easily, efficiently, accurately, and meaningfully perceive the story that the information has to tell. To do this, we must understand the perceptual strengths and weakness of various graphical means for displaying particular stories. To do this, we must understand perception. Data visualization is effective because it shifts the balance between perception and cognition to take fuller advantage of the brain’s abilities. Seeing (i.e visual perception) which is handled by the visual cortex located in the rear of the brain, is extremely fast and efficient. We see immediately, with little effort. Thinking (i.e. cognition), which is handled primarily by the cerebral cortex in the front of the brain, is much slower and less efficient. Traditional data sensemaking and presentation methods require conscious thinking for almost all of the work. Data visualization shifts the balance toward greater use of visual perception, taking advantage of our powerful eyes whenever possible. Proximity Objects that are close together are perceived as a group. Similarity Objects that share similar attributes (e.g., color or shape) are perceived as a group. Enclosure Objects that appear to have a boundary around them (e.g., formed by a line or area of common color) are perceived as a group. Closure Open structures are perceived as closed, complete, and regular whenever there is a way that they can be reasonably interpreted as such. Continuity Objects that are aligned together or appear to be a continuation of one another are perceived as a group. Connection Objects that are connected (e.g., by a line) are perceived as a group. One of the great strengths of data visualization is our ability to process visual information much more rapidly than verbal information. Preattentive visual processing is that part that automatically occurs in the brain prior to conscious awareness. It consists of several stages, each handled by specialized neurons that are tuned to detect particular attributes of the visual information contained in light that reflects off the surfaces of objects in the world, which is then stitched together into a picture in our mind’s eye of that object. We can use these basic attributes, such as differences in length, size, hue, color intensity, angle, texture, shape, and so on, as the building blocks of data visualization. When we do so in an informed manner, we have the ability to transfer much of the work that is needed to decode the contents of a visual display, such as a graph, from the slower conscious, energy intensive parts of the brain to the faster parts of the brain that require less energy, which results in more efficient cognition. All of these are being pursued to some degree, but could be exploited more quickly if more researchers focused on solving real problems that we face in the world today. Several good books have been written about data visualization. The following, in chronological order, are especially useful for surveying the field and as a source of basic instruction:. Tufte, Edward R. (1983). The Visual Display of Quantitative Information. All four of Tufte’s books are exceptional, but his first is the best. It makes an inspiring case for graphical excellence. Cleveland, William S. (1994). The Elements of Graphing Data. Data visualization practices focused on the needs of statisticians. Harris, Robert L. (2000). Information Graphics: A Comprehensive Illustrated Reference. An encyclopedic reference for information graphics. Card, Stuart K., Mackinlay, Jock D. & Shneiderman, Ben (eds.). (1999). Readings in Information Visualization: Using Vision to Think. An overview of the best academic research in the field as of the publication date. Few, Stephen. (2004). 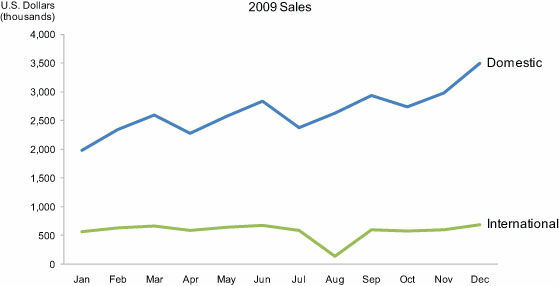 Show Me the Numbers: Designing Tables and Graphs to Enlighten. An accessible, practical, and comprehensive guide to the design of tables and graphs for communication. Ware, Colin. (2008). Visual Thinking: for Design. An eloquent introduction to visual perception and cognition as it relates to data visualization. Few, Stephen. (2009). Now You See It: Simple Visualization Techniques for Quantitative Analysis. An accessible and practical guide to data visualization for analysis.